Description: This is usually a multistemmed shrub that becomes 5-15' tall. Individual branches are often exceptionally long and straight. 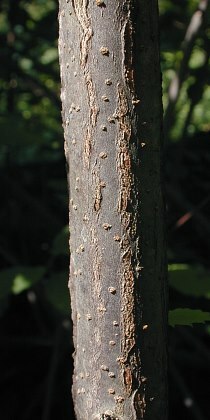 The bark of larger branches is light brown to grey with tiny lenticels and occasional vertical ridges, while smaller branches are light brown, rather smooth, and hairless. Pairs of opposite leaves occur at intervals along the smaller branches and twigs. The leaf blades are up to 4" long and 3" across; they are ovate-oval to cordate-orbicular in shape and very coarsely dentate along their margins. 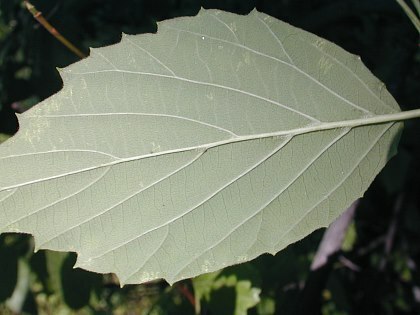 The upper surface of each leaf is medium green, glabrous, and prominently veined, while the lower surface is whitish green and hairless (or nearly so). Sometimes, there are small tufts of cobwebby hairs on the lower surface of a blade where the lateral veins connect to the central vein. At the base of each leaf blade, there is a slender hairless petiole about ¼–1" long. Compound cymes (flat-headed panicles) of small flowers about 3-4" across develop from the upper stems. Individual flowers are about ¼" across, consisting of a white corolla with 5 rounded lobes, a light green calyx with 5 shallow teeth, 5 exerted stamens, and a pistil. The branchlets of the cyme are light green, angular-ridged, and hairless. The blooming period occurs from late spring to early summer and lasts about 3 weeks. The flowers have a musty unpleasant scent. Each flower is replaced by a small ovoid-globoid drupe about 1/3" (8 mm.) long that becomes dark blue-violet when it is ripe. Each drupe contains a single flattened stone (seed with a hard coat). The root system is woody and branching. Cultivation: The preference is partial sun, moist conditions, and a fertile loamy soil. Range & Habitat: The native Smooth Arrow-Wood is occasional in most areas of Illinois, except in the NW section of the state, where it is largely absent (see Distribution Map). Habitats include moist floodplain woodlands, mesic upland woodlands, swamps, partially shaded seeps, and banks of streams in wooded areas. Faunal Associations: The nectar and pollen of the flowers attract bumblebees, Halictid bees, Andrenid bees, Syrphid flies, various beetles, and other insects, which cross-pollinate the flowers. Various insects feed on Smooth Arrow-Wood and other Viburnum spp. These include the aphids Aphis rumicis, Aphis viburniphila, Ceruraphis viburnicola, Illinoia spiraecola (syn. Aphis spiraecola), Nearctaphis bakeri, and Nearctaphis crataegifoliae. An introduced insect, Pyrrhalta viburni (Viburnum Leaf Beetle), feeds on the foliage of these shrubs, while the larvae of the beetle Oberea tripunctata (Dogwood Twig Borer) bore through the twigs. The caterpillars of the butterfly, Celastrina argiolus (Spring/Summer Azure), occasionally feeds on the flowers and their buds. The caterpillars of several moths also feed on Viburnum spp. (see Moth Table). Among vertebrate animals, many songbirds eat the fruit and spread the seeds into new areas (see Bird Table). 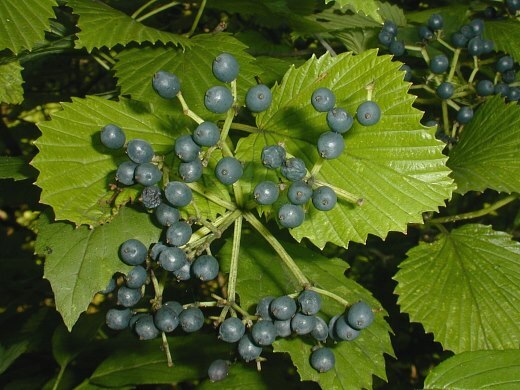 The berries are also eaten by various mammals, including the Eastern Chipmunk, White-Footed Mouse, and Red Squirrel, while the leaves, bark, and/or woody branches are eaten by the Beaver, White-Tailed Deer, and Cottontail Rabbit. Photographic Location: Busey Woods in Urbana, Illinois. Comments: Smooth Arrow-Wood is very similar to Viburnum dentatum (Arrow-Wood) and it is sometimes considered a variety of the latter species. Smooth Arrow-Wood has leaf undersides that are hairless (or nearly hairless), while the leaf undersides of Arrow-Wood have fine downy hairs. Generally, these two species differ from other Viburnums spp. (Viburnums) by their coarsely dentate leaves and foul-scented flowers. Their drupes are rather sour and unpalatable to humans, although this characteristic is not unique among Viburnums. In other respects, Arrow-Woods are attractive ornamental shrubs and they are sometimes cultivated for this purpose.